I would like to introduce you to a very special family: Heidi, Dale, Caiden, Dawson, Cole and their dog, Kit. I would like to introduce you to a very special boy, Makenson. I believe it all started around 3 years ago. 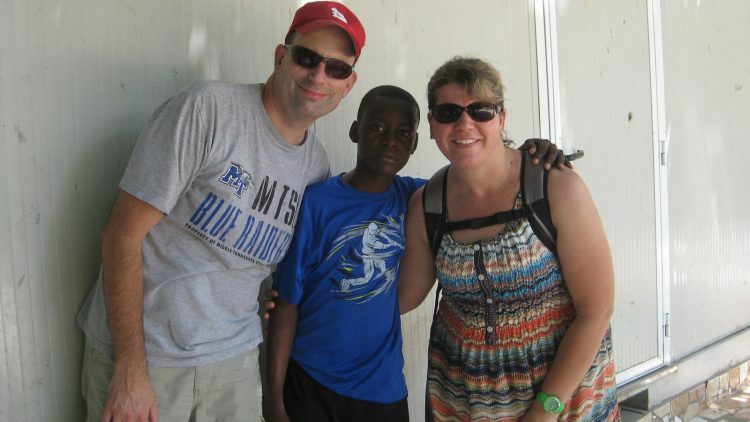 Heidi was called on a missions trip to serve God in Haiti. Little did she know, with this trip, God had a plan for her and her family. By the end of her visit, she knew what God had been speaking to her. So as she traveled home she continued to pray that for sure this is what she was to ask of her husband, Dale, and their three boys. Upon her arrival home she did just that. She explained how much love, joy, and happiness she felt for this boy and just knew it was their calling to pursue adopting him as one of their own. Dale, being the Christian man he is, agreed and being supportive, prayed along with her as their journey began. They since then have visited a few times now…finding out a little bit more about him. Mak is 14 years old. He loves soccer and has a great smile. He’s excited to be a part of their family. He now calls them Momma and Papa and is just waiting for all the paperwork to be finalize for the adoption. Sadly, the process is long, confusing, and lets just say, exhausting. While finally being approved to be Mak's parents, a large amount of paperwork still needs processing, another installment of funds needs to be paid, and yet another trip will need to be scheduled for the homecoming. Therefore, Heidi and Dale will have to continue to wait, while their boy also awaits for them to travel back to take him home. These trips become expensive and tiresome. But with the love, support, and encouragement from family and friends, and the strength and faith in God, it all will happen. That’s where you can help. I would like to invite you to be a part of their adoption by giving financially. When you give, you become emotionally invested. This fundraising is in efforts to create a community of friends, family and neighbors, who are ready and excited to welcome Mak into their lives as their son. With your donation, Makenson will finally receive a warm and loving embrace of a mother, and the joy and teachings of a Christian man from a father. He will have brothers that love him and are excited to share with him. He will know what it feels like to be tucked in and kissed goodnight, warm and safe in a caring home. He will receive full medical attention, proper, nutritious food, a childhood that allows him to be a child and an environment where he can thrive and flourish and reach his full potential. He will finally have the loving family he so patiently waited and prayed for. This is not theoretical. This is not a faceless charity. You know them…they are family. I hope you will love and support them as I do as they continue this adoption. I challenge that you ask God if He would like you to give and be part of their team. Please pray with faith that God will move mountains to finally bring this boy home. Thank you for taking the time to let me share my story of this incredible, strong willed, amazing, Christian family. I love them all so much! We have exited IBESR in Haiti and have moved on to the court phase. The court phase has been taking families an average of 130 days to complete. At the end of the court phase, the child's passport is issued. We are deep in the final stages of our adoption. Thank you for any donations. And asking God to bless you and your family!